Cellulite is almost exclusively a female problem, effecting over 80% of all women over the age of thirty. Despite popular belief, cellulite doesn’t just effect effect women who are over weight, it effects all women whether you are the ideal weight, over weight or obese. Cellulite is the name given to lumpy or dimpled appearance on the skin, most commonly effecting the thighs and bum in women. While being overweight is a contributing factor, cellulite can appear on women who are in good health, who eat a good diet and exercise regularly. 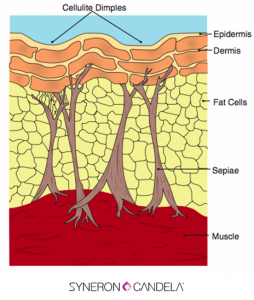 The deposits of fat that everyone has in their body can be divided into two main camps, visceral and subcutaneous. Visceral fat surrounds your major organs. Many people refer to Visceral fat as the dangerous fat, linked to a higher risk of heart disease and diabetes. This is the fat the can only be reduced through “healthy life style”, i.e. eating well and exercising regularly. Subcutaneous fat is different entirely, this is the fat that is closer to the surface and can be reduced through a “healthy life style”. Alternative ways to remove subcutaneous fat is via liposuction or non-surgical liposuction (body contouring). Cellulite is a bit different to regular Subcutaneous fat, cellulite appears in the layer of Subcutaneous fat that is closest to the skin. It also forms or is stored in compartments separated by connective tissue called Septa which is capped at each end with another layer of connective tissue. If the volume of fat in this container of connective tissue, the top will bulge under pressure causing the dimpled effect we associate with cellulite. On a different note an interesting article related to cellulite and timely around summer time is this article – Dangers of Spray Tan and Laser Hair Removal Melbourne. A good read. Sydney is one of the fastest growing cities for cellulite treatments. If you are looking for cellulite removal treatment in Sydney, check out Smoother Skin. In Melbourne you can check out Feel Good Laser & Skin. Both use the VelaShape III by Syneron-Candella which is FDA cleared for the treatment of cellulite.